Now there is place for everything from garden tools to sports equipment; automotive accessories, kids toys, even dad's workbench. A great looking, organized garage begins with the ORIGINAL, rugged, versatile storeWALL HeavyDuty wall panels and the right accessories. 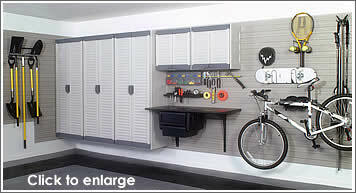 Ultimate Garage has the largest selection of garage storage accessories available for storeWALL storage system. Get that stuff off the floor, out of the driveway and onto the walls. The totally organized, totally flexible garage storage system you always wanted is here. It all begins with storeWALL’s heavy duty slotted wall panel. Just add hooks or shelves or bins or cabinets or baskets. There are over 100 different accessories that are easy to install, quick to change and amazingly adaptable. 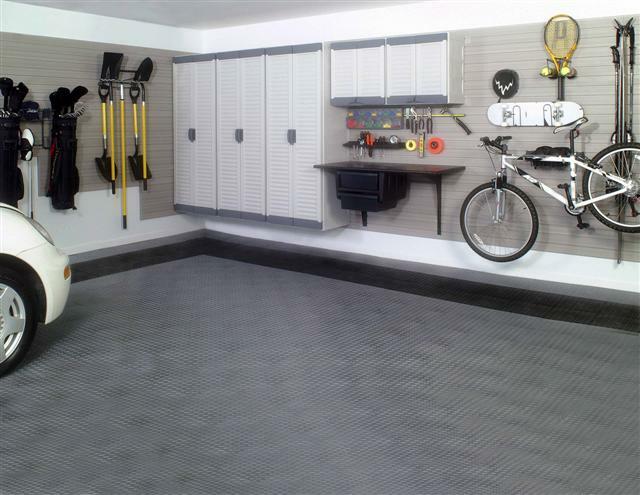 Organize your garage one way today, another way tomorrow. Solve small organization problems with one panel, large ones with a whole wall. Design your garage your way – the modular storeWALL panel comes in your choice of colors. For tough garage environments storeWALL is heavy duty. It is an industrial strength PVC wall panel that is waterproof and weather proof. It’s perfect for open garage conditions – install it indoors or out. Wall storage systems are the perfect solution for efficiently storing sports equipment, lawn & garden tools, workshop tools, or just about anything else you could find in a garage. Wall storage systems are light years ahead of old fashioned pegboard. Unlike pegboard, our systems securely hold your hoses, power extension cords, rakes, shovels, etc. to your garage wall. Visual inventory combined with proper tool or item storage saves both time and money. StoreWALL makes getting organized fast and easy. In less than a day and for less than you think, you can have a place for anything and everything in your garage . . .including your car. If your garage faces the street it is approximately 30-50% of the total home viewed by neighbors and/or people driving past. If your garage is organized and clean with all contents behind cabinet doors or neatly stacked and racked, aesthetically it is a much more valuable home. According to a national survey, 78% of all dollars spent on garage storage are returned to the owner at the time of sale or appraisal. The 2000-2002 Peachtree Home Owners Survey revealed that 67% of homebuyers are interested in storage solutions. In fact, the survey shows that interest in organization systems for the garage is second only to those for the kitchen.